Carey is a practice manager in Orlando, Florida who believes in being transparent with clients. This year, her practice has decided to include clients in the more behind-the-scenes of routine tests and examinations. Her practice believes its clients should have access to medical records any day, any time in case of an emergency or for any other reason, like traveling with a pet. “Providing our clients access to their medical records allows them to share their pet’s full medical history in case they may need it and we’re not open,” says Carey. A handful of practices still fear giving pet parents access to their medical records. Why? Because they worry their client will leave them. But the truth is, whether you provide access or not, they’ve likely made that decision with or without record access. Sharing medical records as a general practice worldview is a proactive way to build trust and loyalty with clients. It’s actually a method of retaining clients instead of losing them. And it’s showing that you’re truly invested in the health and safety of a patient, whether they’re inside your practice or on a road trip visiting family three states away. Pet’s can’t talk, so if something happens to them it’s vital for their medical history to be accessible. It could be life-saving information. It’s your job to keep them healthy and it’s also your job to help your clients be the best pet parent they can be. 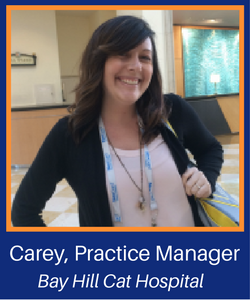 Carey and her team are just a few of the many practices who truly put their patients’ health first. Be like Carey. Be transparent. Share medical records and empower pet parents. It could save a patient’s life and grow your practice.